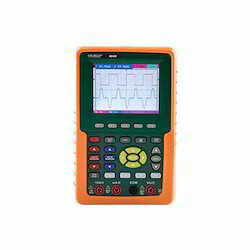 Oscilloscopes are used to observe the change of an electrical signal over time, such that voltage and time describe a shape which is continuously graphed against a calibrated scale. The observed waveform can be analysed for such properties as amplitude,frequency, rise time, time interval, distortion and others. Modern digital instruments may calculate and display these properties directly. Originally, calculation of these values required manually measuring the waveform against the scales built into the screen of the instrument.